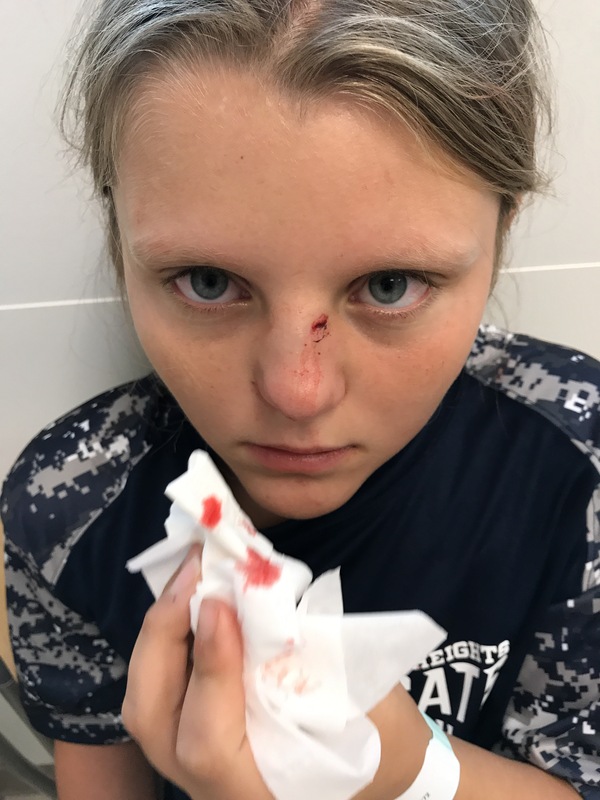 And she took one to the nose on Sunday. The Universe had given her a break on blows to the head but decided she needed one to the slope of cartilage and bone on her heart-shaped face. Oh, my poor girl. But, as with everything, she took it like a champ. 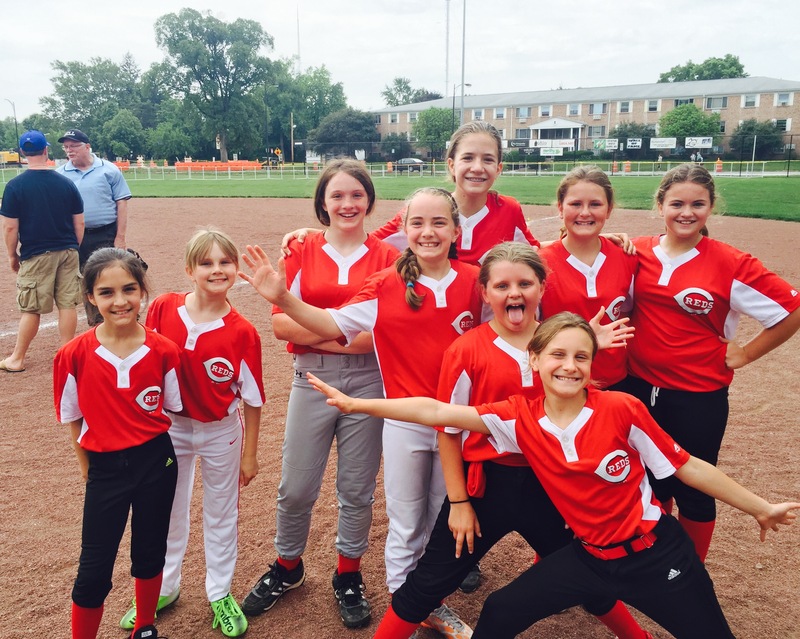 Ri had not wanted to go to her softball double-header on Sunday morning. She has gotten really into soccer this season, and wants to concentrate all of her efforts on that sport. But Jon and I told her that she had committed to fall ball, and therefore, needed to finish out the season. In any case, there were only three more doubleheaders to play before the season ended. She obliged us and left in good spirits with Jon at 9:30 am for her games. I arrived near the end of the first game to see her get a hit to shortstop and thrown out at first. She walked over to where John and I were standing, and gave me a hug. “Did you see my hit, mom?” I told her that I had seen it and Jon chimed in that she got an earlier hit and made it to first. With those congratulated her and told her to get back over with her team. She rolled her eyes amusingly and skipped back over to her teammates. John left after the first game but not before getting her a big hug and telling her he loved her. Ri was excited because they had small packages of Pringles for snacks between the games. She sat with her teammates enjoying her sour cream and onion chips. Game two began shortly after the girls finished their snacks. I sat on the bleacher bench next to some friends. We were talking about the latest and greatest news and podcasts when someone yelled out “Maria got hit.” I looked out into left field and there she was curled up in a ball with five people surrounding her. I did not jump up immediately with the hopes that they were taking care of her and she was fine. But then someone said to me “she is bleeding pretty good, she may need her mom.” I hopped up and rushed out to see her. When I arrived, I saw a large pool of blood in the grass and four large washcloths soaked with my baby’s blood. It was coming out of her nostrils and from a gash on the top of her nose. Luckily, my girlfriend is a nurse and was able to both control the bleeding and calm Ri down. 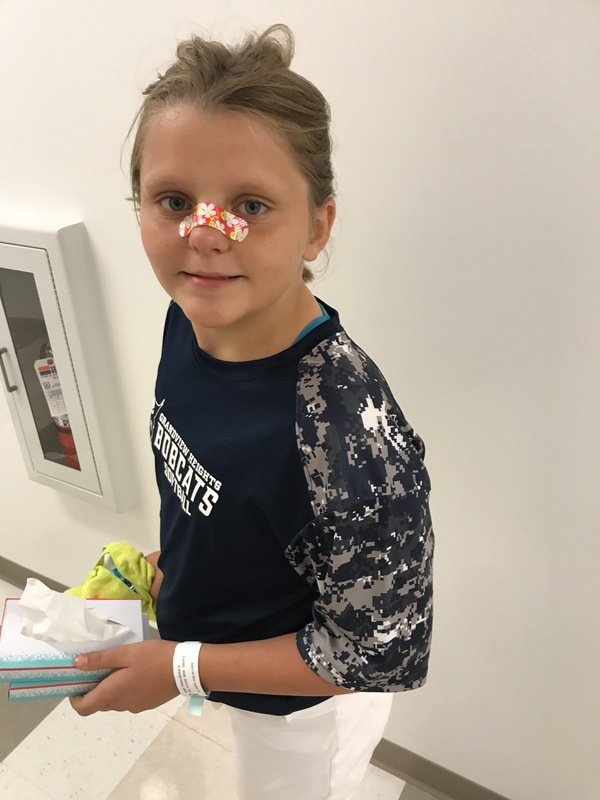 We were finally able to walk her off the field with washcloths under her nose to catch the continued bleeding. Once we hit the bathroom, the bleeding had slowed to the point Ri could hold a cloth up to her nose and it would not be drenched within seconds. She was so upset. I just knew she was cussing me out for making her go to the game. I was cussing myself out because now look at us – we were going to have to spend the entire day in the hospital and who knows if she’d play soccer again. Was there a way to turn back time? Everybody was so helpful in gathering up Ri’s things and getting her to my car. We zoomed along the highway to the Utgent Care. Ri was so nervous; she did not want to get stitches. The girl who loves shots was worried about a few stitches. The mind is a wondrous thing. She did not care at all about how she looked, all she cared about was not having to get those darn stitches. The team of medical folks got us in fairly quickly but then we waited for the doctor for quite some time. I needed something to keep Maria’s mind occupied so we looked at the history of Elena on Instagram. Maria could do that once a day and never tire of it. The doctor finally strolled in and took a look at Maria. She was friendly and answered all of Maria’s questions. The first question being “will I need stitches?” She answered the way Maria wanted her to with a resounding “no.” It was as if Maria had been carrying 100 pound weights on her shoulders and someone had lifted them off her. She felt around Maria’s face and neck and looked into her nose, and declared that she did not think it was broken. Thank goodness! She gave us direction on how to care for her nose over the coming weeks, and did talk about the possibility of a scar where her gash was located. 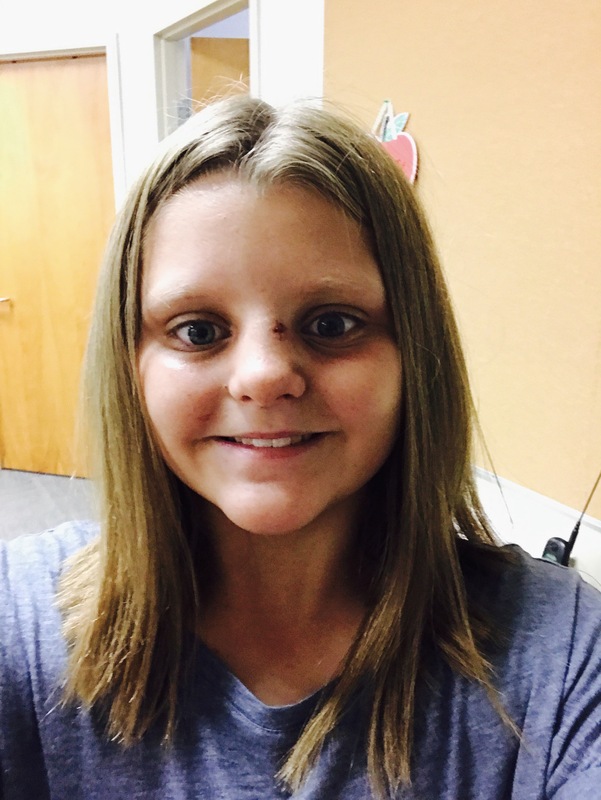 Ri could have cared less about anything she was saying – not about the scar, not about any deformity – all she cared about was that there was no stitches. We were excited to be able to leave. Maria had a date with her girlfriend to hold puppies that had just been born three weeks ago (Maria was addicted to them, and had spent most of the weekend holding them with her girlfriend). I was hoping to hit the tail end of Mario’s football game. But then the door creaked open, and the doctor poked her head inside. 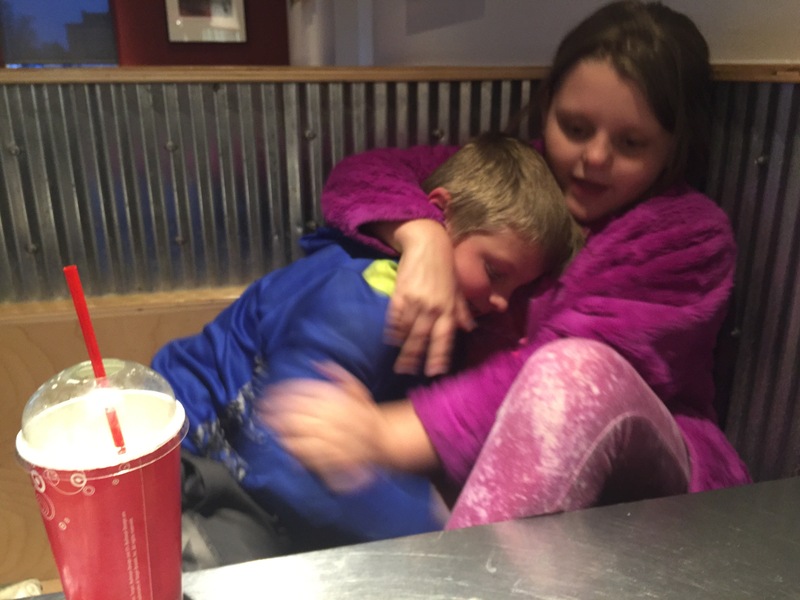 “I am going to have to order an x-ray just to make sure her nose is not broken. They should be in soon to get her.” My stomach dropped. 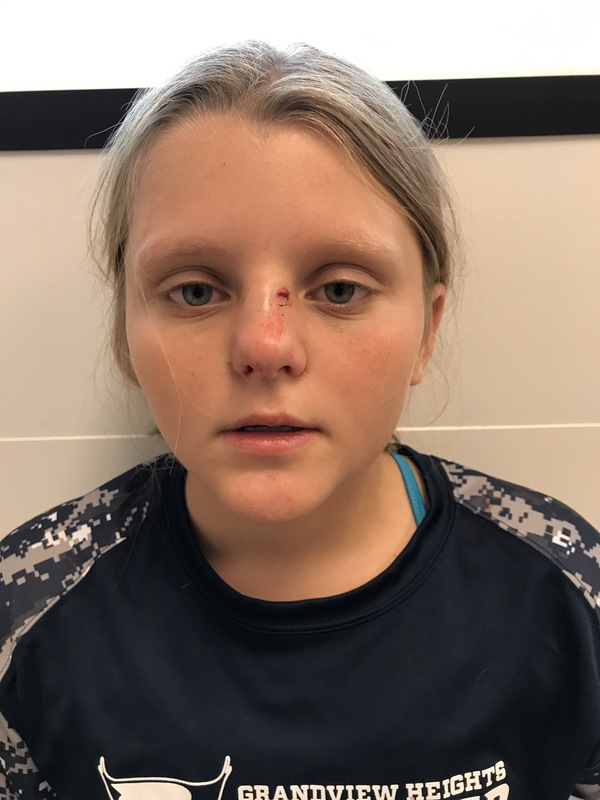 I kept thinking “if the doctor did not think it was broken then she is most likely correct, right?” Oh, I did not want Ri to deal with a broken nose. Ri, true to form, was only concerned about those stitches. 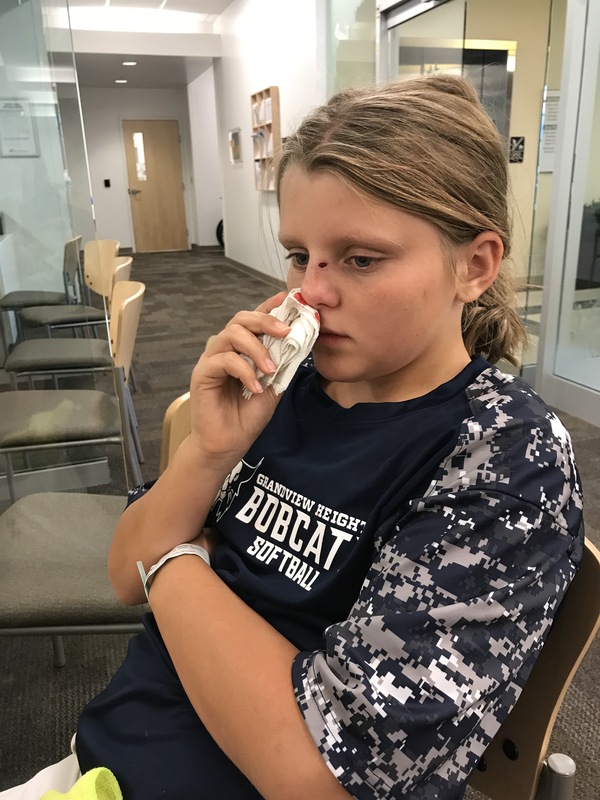 She asked whether a broken nose would require stitches. I felt a bit of a relief when the doctor informed us that the fracture may very well heal on its own. She thought that there was more of a chance that it would heal on its own then we would have to get surgery. That was the best I was going to do for the day and so I took it and ran with it. And so they came in and cleaned up Maria’s gash, gave us some tips on treatment, and told us to continue to keep an eye on the shape of her nose as the swelling went down. Maria made jokes on our way home, and begged to go to her friend’s house to see the puppies. You would not of thought that she just suffered a broken nose. Later in the evening, when she returned from her friends house, she did start to feel a little puny. I gave her Tylenol and a massage. She was asleep by 8:45 PM. 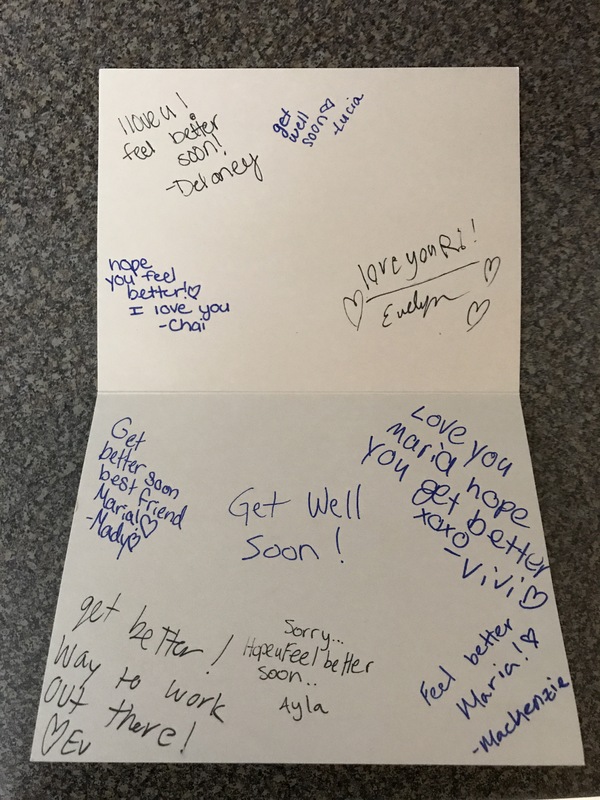 When I came downstairs, I found a get-well note signed by her teammates as well as the $5 bounty the coach gives to the player that played best during the game. I also received a delivery of frosted animal crackers from Ri’s girlfriend (she knows Ri well). After times like these, I am always reminded of how great of friends Ri and I have in the community. The next morning, Ri woke up in a great mood. Surprisingly, and who’s had not swelled up beyond belief. It was definitely better but not as big as Jon and I thought it would be. She begged to play in her soccer game that evening but Jon and I nixed it. She was mad at first but then reasoned “if I can’t play 100%, then I really don’t want to play anyway.” She sent me s text during the day informing me that her nose “didn’t look that bad.” She partied it up with her teammates on the bus ride to the soccer game and wanted to stay to watch the boys play after her game. She likes to ride the bus home with her teammates and the boys soccer team because they sing and act silly. She could’ve cared less that she had a big old broken nose going on. She came waltzing through the door at 8:30 at night singing and laughing and yelling “what’s up? ?” I asked how the game was and she explained that they lost. She said at one point somebody was complaining that they had a headache and she said “I looked at them and said ‘I feel your pain girl, look at this nose of mine! '” Damn, how I love our girl’s self-deprecating style. she can roll with some serious punches. I am not quite sure that Mario or many other kids would have such a great sense of humor and positive attitude in the same circumstance. But let’s not find out anytime soon. This is how we rolled on Sunday morning. Boys stuck together and girls stuck together. Ri wanted to roller skate and I wanted to walk to Stauf’s. 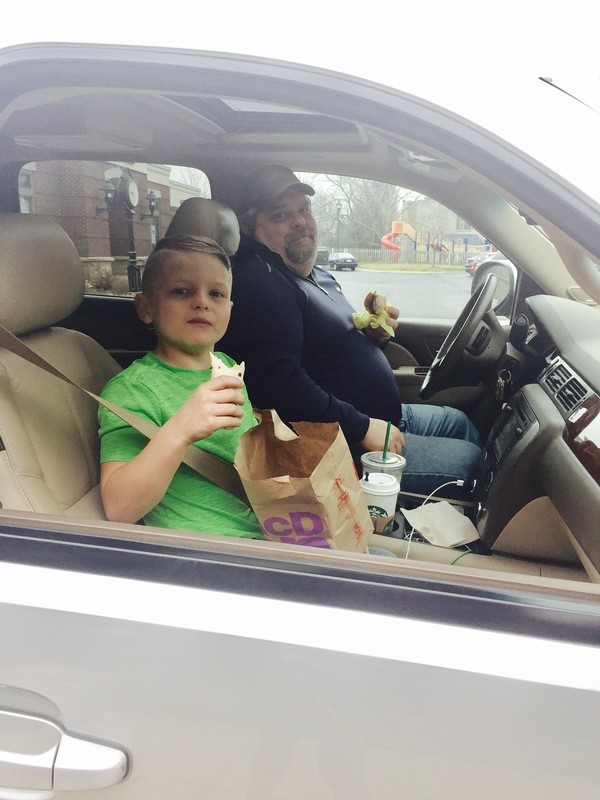 Jon wanted his coffee and Mario wanted to hang with his dad (and score a cinnamon roll). We ended up meeting each other on the Avenue. The boys were grooving to music as Ri and I talked about her school project – making bath balls. They ended up following us to Stauf’s because who can pass up Stauf’s?! After Stauf’s, we hung together through one of Mario’s basketball games and then took Ri home so she could get to her soccer scrimmage. Jon and I watched Mario’s second game and then I drove back to watch the end of RI’s scrimmage. I made sure she got started on homework and then headed backwards up north to Mario’s championship game. He almost won it (and played so hard). 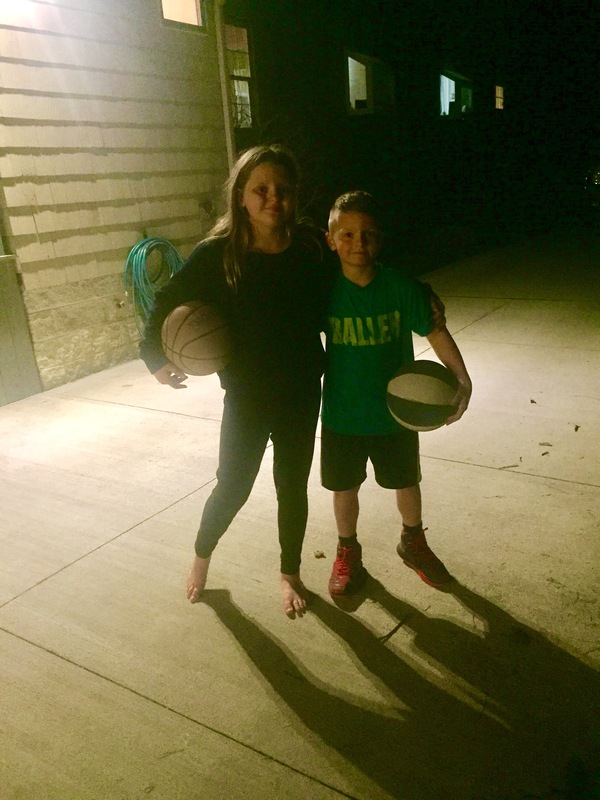 We headed back home for some evening b-ball outside. Jon and I commented how we couldn’t wait for Spring while the kids played one-on-one and poked at each other. These days are busy yet bountiful. I want to ensure that they are not forgotten because I’m confident they will bring us comfort and joy when the kids have moved out, and Jon and I are playing our fifth round of Yahtzee on the back porch. So just a day after I posted my last blog about giving the kids feedback on how they played during their games, I read this article. Life is about constantly growing and learning, right? I love this approach. It isn’t off-putting like giving feedback may be to a kid who just listened to the coach drone on about the game for 15 minutes. It’s not accusatory like giving feedback about certain plays on the field. It allows the child to think through actions on the field and arrive at his or her own self-feedback. It also reinforces that we are all here to learn – in sport, in school, in relationships. We are far from perfect at any age, and need to embrace the constant quest. To that end, I think I will add this to my repertoire and ask myself this same question at the end of my days. “What did I learn in that meeting? Take me out to the ball game…again and again and again. The beginning of Summer break has consisted of baseball, softball, and more softball. We should be used to this chaos that lasts from Memorial Day through the first week of July since I’ve been coaching Ri’s team for the last three years and Mario’s been playing baseball during that time, but this year feels different. I think it’s because Mario’s games are more exciting due to him making great plays and big hits, and Ri’s games are exhilarating between the sliding and the third-dropped-strike rule. 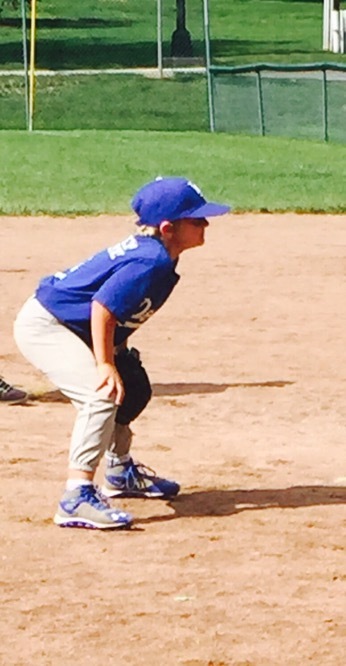 I am a nut job during Ri’s games trying to watch for the dropped strike, the runner stealing, the fake bunt…. Mario looks like a pro baseball player in an eight year old body. He is in position before every play and in the batter’s box swinging away before he gets up to bat. He loves baseball this year. One reason why: he’s the oldest on the team this year. He’s one of four second graders. The rest are first graders. And he is one of the best players on the team. Hence, super stardom at every game when he makes an out or gets a hit. And he’s been making them like mad. He got all three outs on numerous occasions. He’s hit quite a few doubles. And his face is priceless when he gets an out. He hears the cheers but he just keeps on his game face and stares straight ahead. Mr. Cool. And holy cow, Maria! She has stepped it up to the nth degree this year. The first game, she caught two fly balls. Jon and I stood with mouths agape, so proud of her. 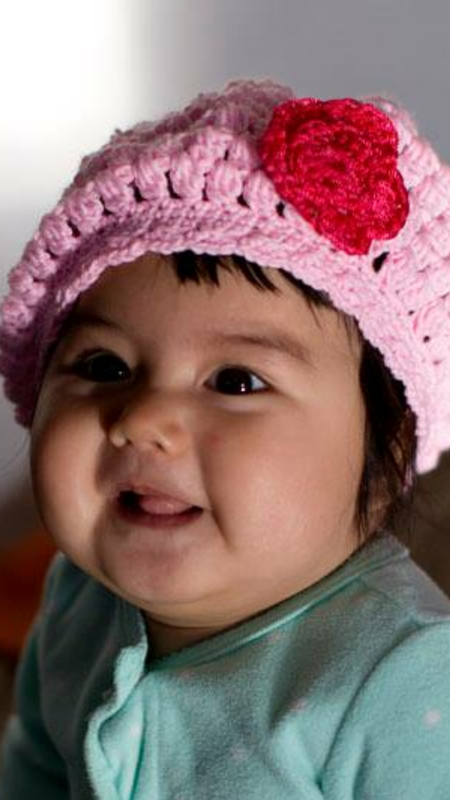 And unlike Mario, she shows her enthusiasm. She smiles as wide as the outfield and does a little dance shuffle. It is so sweet. I keep wanting to get a picture but since I’m coaching, I have no ability to think about a snapshot. Strategize, strategize, strategize. Jon and I are both so impressed with Ri. She has made nearly every catch thrown to her. I’m playing her at first base and she is covering it like a glove. She’s completely aware and ready during the games. She moves. It’s a beautiful thing that was not seen much by any of the girls last year. This year is a different ball game. I hit the jackpot with my team this year, too. All the girls root each other on and have a great time together. I have a sixth grader from another school who is a star pitcher and batter. She’s got a heckuva arm and hit one to the fence the other night. But she is the most humble and considerate girl. She cheers on the other pitchers who are struggling to make it over the plate. She gives tips to the girls up to bat. She never whines or gets mad when we lose a game. 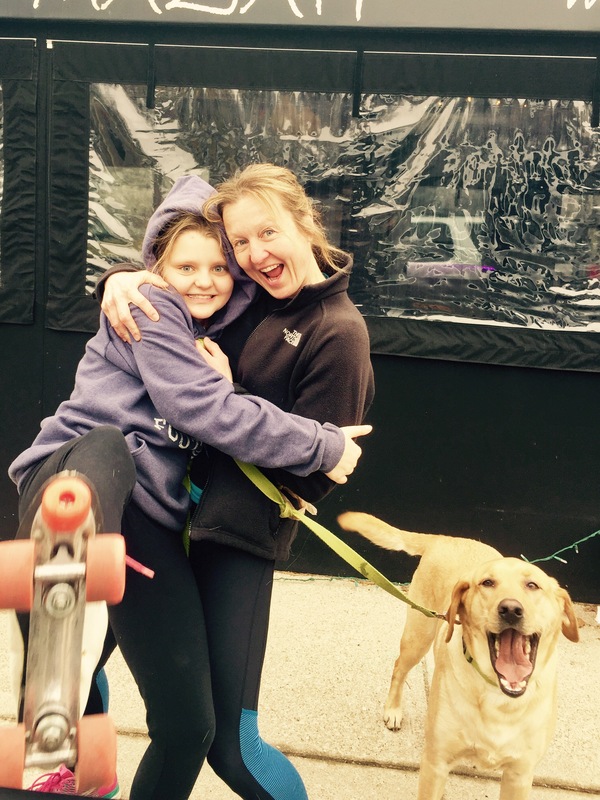 She’s been an awesome 6th grade leader. Ri has gotten close to her over the past few weeks and looks up to her. Ri has stepped up to lead the team as well. It helps that she has her mother’s lungs and so it’s easy to scream for the girl up to bat or pitching on the mound. Ri cranked it the other night as pitcher. She had not been happy with her pitching a couple of games back. She had gotten some walks and gotten hit on a few times. She looked at me several times and whispered “pull me.” Yea, I’m serious. The girl gets really frustrated, really quickly. We are trying to work with her to calm her emotions down and take deep breaths. It’s the only way she will be able to pitch well, much less have fun with the game. I’m so happy to have Jon near me doing the scorebook because he’s able to grab her when she’s upset and talk some sense into her (or give her a wet willy). I took her out to the front yard before our game this past Monday to throw with her. She started to get angrier and angrier with each minute because she was throwing balls and only a rare strike. After ten minutes, she threw her glove down and ran inside. She was hysterically crying and telling me she could not play. She didn’t want to lose. She didn’t want to mess up. She was hugging me and sobbing. I felt so badly for her and was worried because I had not seen her act like this before. After a few minutes, she settled down and laid her back against the kitchen wall. I rubbed her back and got her water. After some breathing exercises, we drove down to the game. 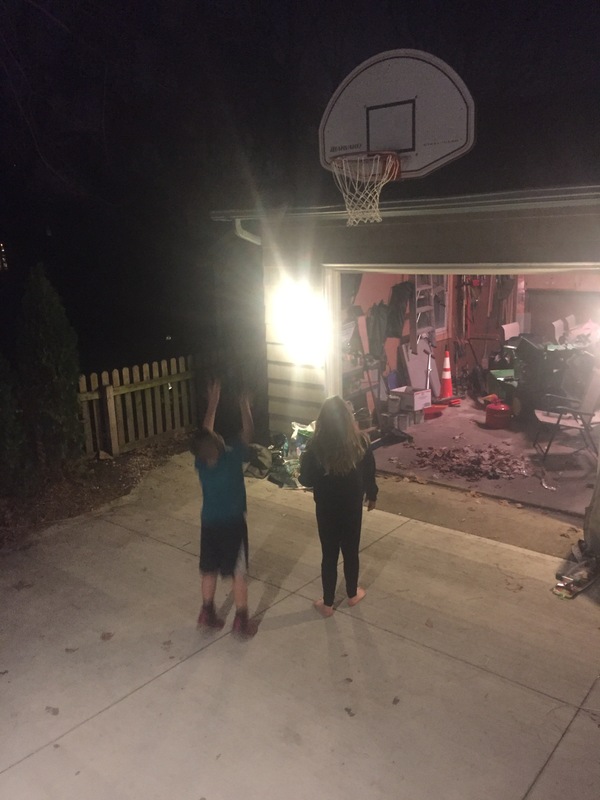 She jumped out of the car – completely unphased by the past twenty minutes – and chatted it up with her teammates while they watched the remainder of the game before us. I put her on first base the first inning and she made an out. When she came in for the bottom of the inning, she said she wanted to pitch. I told Jon if she started to flip out, I’d have to pull her. But what did she do? Threw strikes and caught a pop up ball to get out of the inning with no runs scored. She was so charged up. And the next inning, she hit a double! Oh, the intense feeling of joy you get when you see your daughter in her element and so happy. I was at once relieved and excited and proud. She had a heck of a night. I think melt-downs pre-game may need to occur in the future…. As hectic as June is with baseball and softball, Jon and I would not change a thing. It is a treasure to be able to watch our kids play hard and achieve new feats (as well as learn how to deal with the hardship of a missed play or loss). And I get the added boost of being able to coach a group of girls who love the game and want to learn and succeed. Couldn’t ask for a better start to the summer.